A little later than expected we headed to downtown Killarney to hunt for Orla Kiely merch on sale. I scored a porcelain box and a handbag on sale and treated myself with 2 bone china coffee mugs with my favourite patterns. Funniest part of the shopping definetly was the shop lady wrapping up the two tiny mugs in the biggest piece of bubble wrap that you can imagine. She started to wrap one mug, when she was done she noticed that with the current bubble wrap rate she was going, the second wrapped mug wouldn’t fit into the biggest bags they had (which were huge….). So she unwrapped the whole thing again, cut the bubble wrap in half and wrapped each mug individually, so that both mugs fitted in the very huge bag… Imagine 2 tiny mugs and a whole lot of bubble wrap taking up a whole bag that could probably fit 3 shoeboxes… Thinking of it still makes me chuckle… Before we left town to head for the Ring of Kerry, I had my obligatory Icecream at Murphy’s. It was my turn to drive that day, the morning was rainy and I was a little scared that the perfect weather conditions we experienced throughout our trip were over. 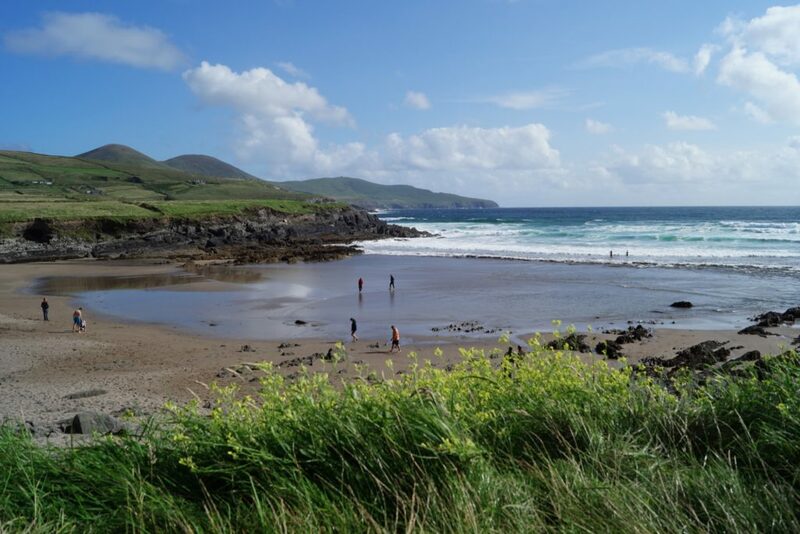 In a magazine about the area that our host supplied us with, we had read that busses are only allowed to drive on the Ring of Kerry counterclockwise and so we decided to follow the same direction to not have to tackle masses of busses coming our way. 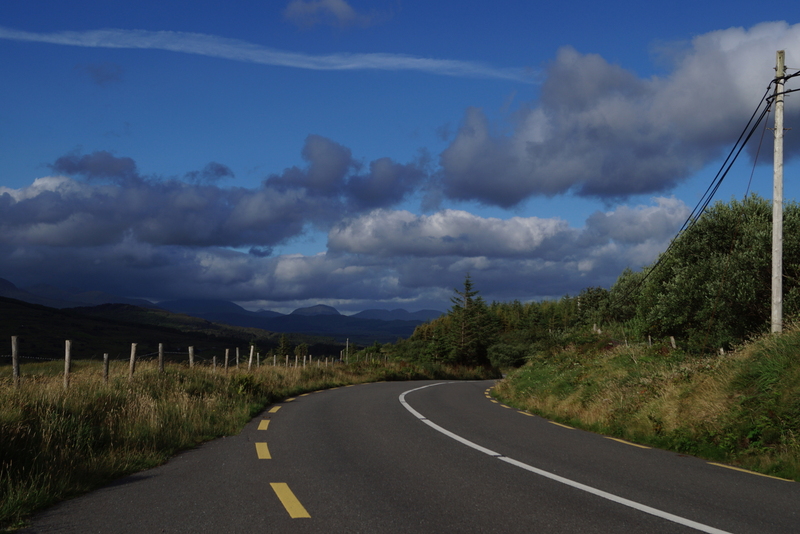 Roads in Ireland are pretty narrow from times, especially on the countryside, I tried to avoid oncoming traffic of big vehicles whenever possible. There were a few roadworks going on. Apart from manual traffic lights aka people standing on the road with signs, we even saw people on quads with signs, and on this day we passed a site with a „follow me“ safety car. I find it remarkable how profane things like construction sites are handled in other countries and this was the first time in my life that I had to follow a safety car. 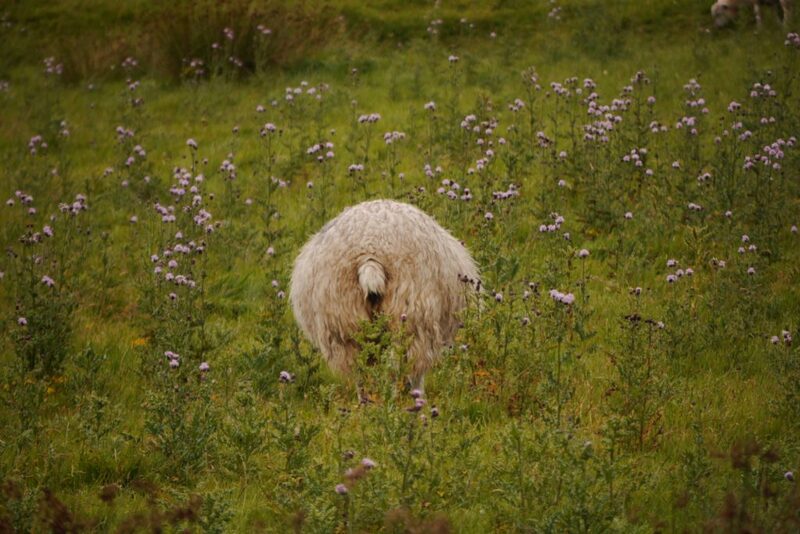 It was rainy and misty, no chance to see the Dingle peninsula as we drove along the northern edge of the ring of Kerry. 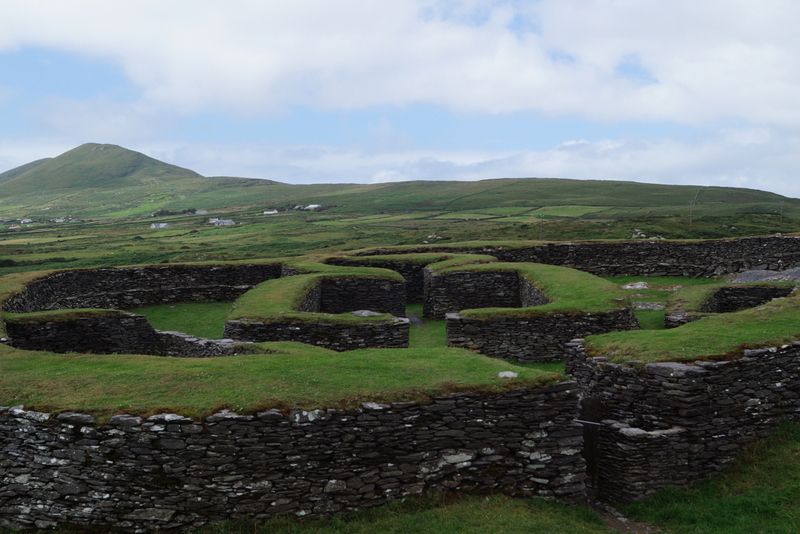 We made our first stop at Leacanabuaile Stone Fort and as soon as we got out of the car, the rain stopped. While we wandered the lush green hills with the stony patches the sun even came out. We had the chance to take a closer look at the country population. 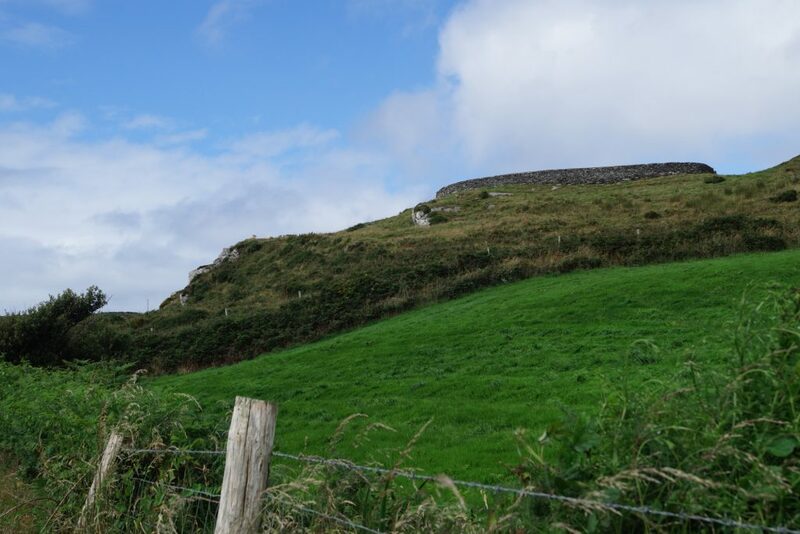 There is a second fort (Cahergal) close by as well as the ruin of Ballycarbery Castle. 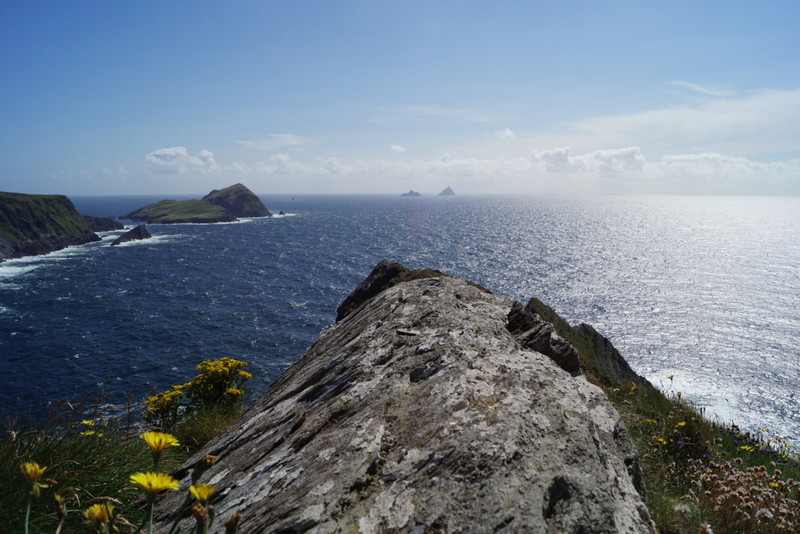 I only found these places on Instagram and put them on the travel plan… On a clear day you can view all the way towards the Dingle Peninsula and might even see the Great Blasket Islands from there. 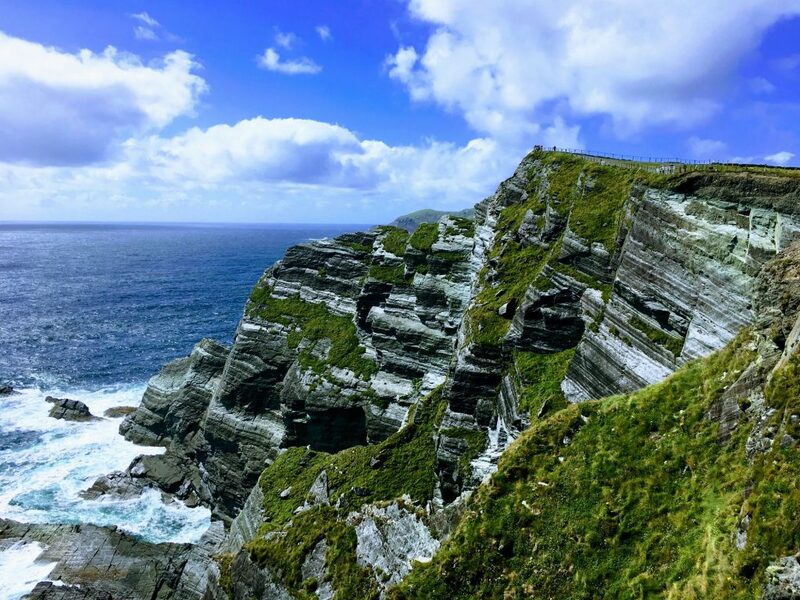 The landscape with the rough rocks that form layers like slate is just very impressive, paired with lush greens and blue skies this country creates it’s own kind of magic. 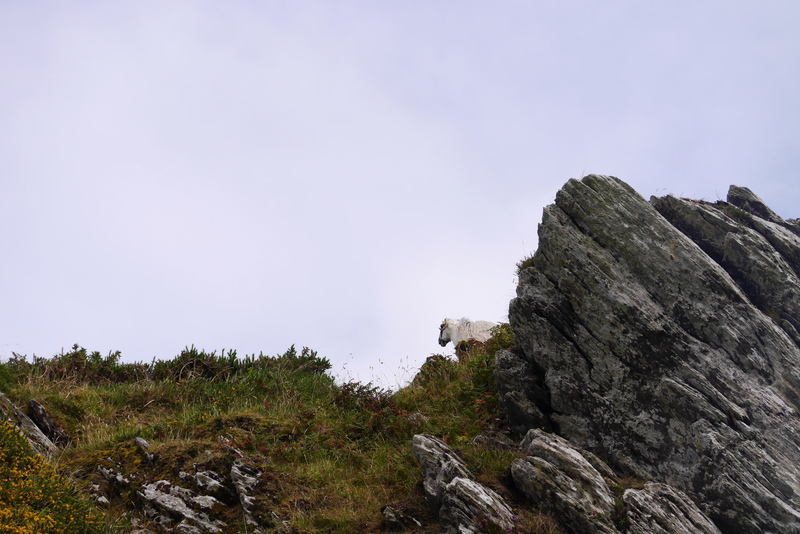 We stopped for lunch in Portmagee, which was nice but stuffed with German tourists. How can you tell that tourists are German before they open their mouths? Pretty easy, a lot of German couples wear matching Jack Wolfskin outdoor jackets… On holiday I try to avoid German tourists as much as possible. First because I am on holiday, therefor I leave Germany and second because German tourists often annoy me or make me ashamed of being German. 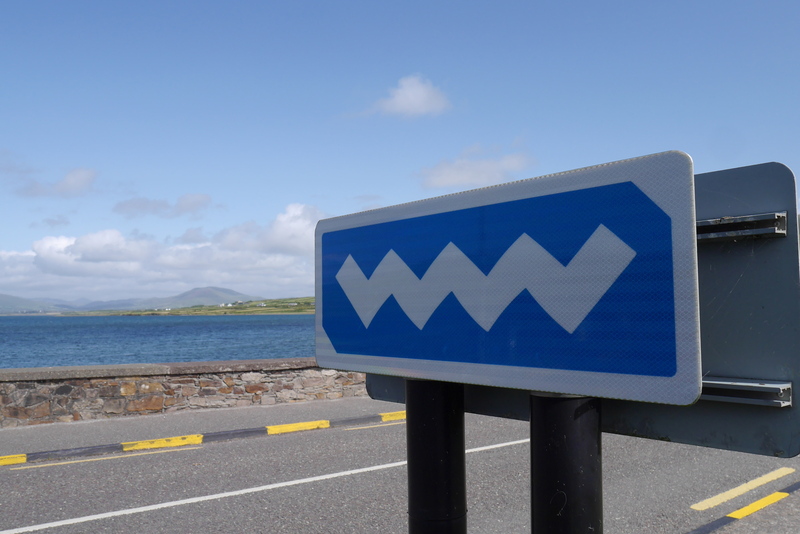 We ditched the idea to drive around on Valentia Island and decided to head towards the Skellig Ring, mostly following the blue Wild Atlantic Way signs. 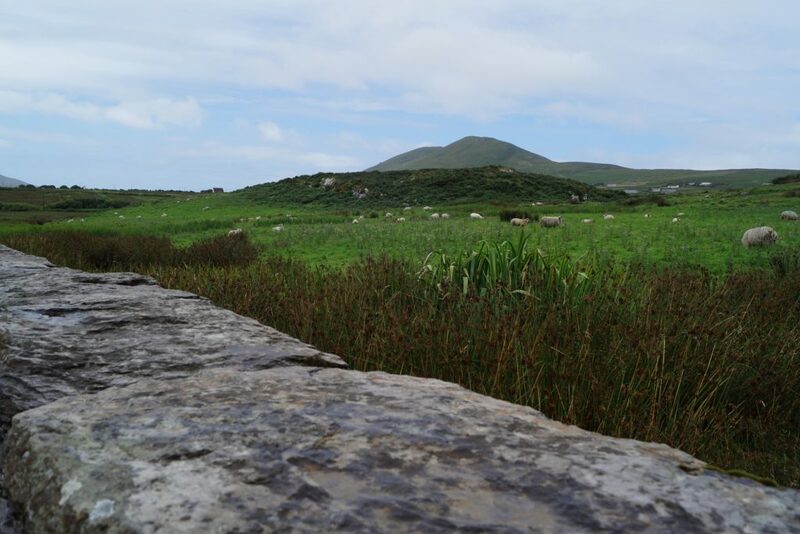 The roads of the Skellig Ring were much more narrow than on the Ring of Kerry. 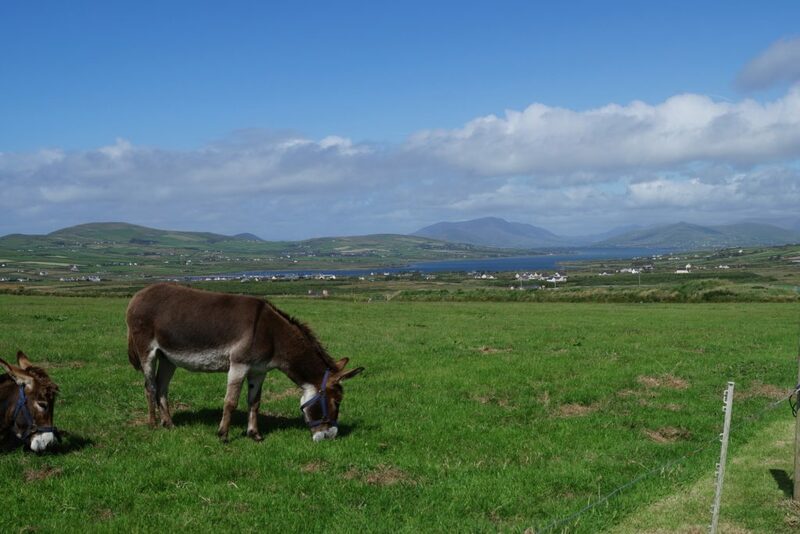 Even though I had been around the Ring of Kerry before, the western part of the peninsula, also known as Skellig Ring, was new to me as I had traveled there by bus last time and the roads there are not big enough for the big busses. We made our way towards the Kerry Cliffs to at least have a look at the Skellig Islands from afar. 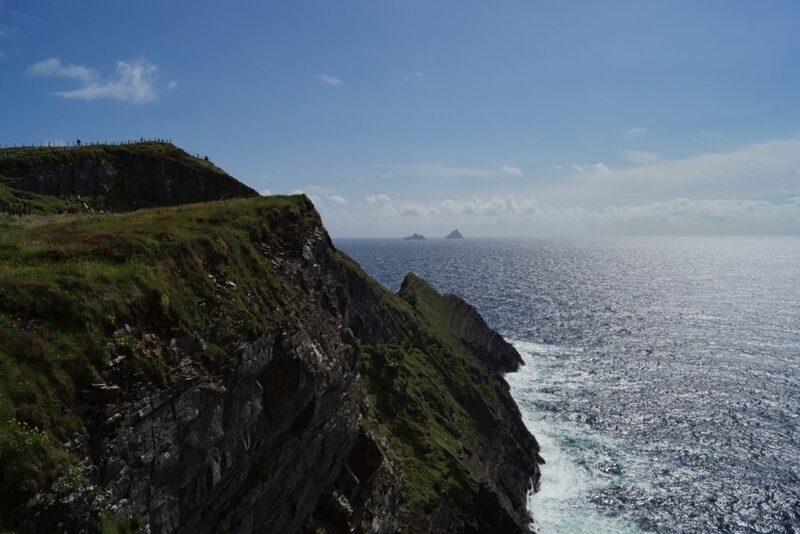 Even though I had a visit of Skellig Michael on my wish list for longer, to see the monastry and maybe some puffins, it has become pretty much impossible to go there since Skellig Michael appeared in Star Wars… There is only one landing tour to Skellig Michael per day, which is pretty pricey and was booked out in advance for months. 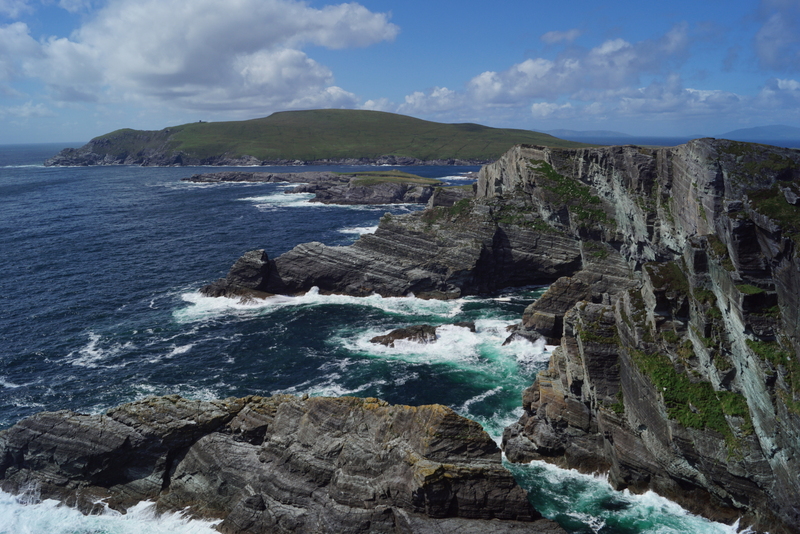 Okay… and here come the cliffs. There is a cliffwalk and 3 different viewing platforms. It was sunny but pretty windy out there. Walking up the hill to the third platform was quite a challenge with the wind strongly blowing in your face, making it necessary to lean into it to get up the hill in small steps. I saw people with kids that couldn’t make it as the wind was too strong. But once you’re up, the view is just stunning. I have no words for how friggin amazing these cliffs were. The wind in my hair, the rough sea, the noises of crashing waves and seagulls, the colours of the different layers of sediment, the vegetation that grows under these rough conditions, the different shades of blue and turquois of the sea, it is simply breathtaking. All of a sudden the situation was resolved, the caravan had pulled back into a cutout further down the hill, I had to yell at my friend to get the hell back in the car or we’d be stuck there for hours. She came running, jumped into the rolling car and we both couldn’t stop laughing until we reached the bay. It was already late afternoon, so we made our way back towards Killarney with only a few more photostops and to grab a sambo at the gas station. I don’t know why, but I feel that this picture is the most epic shot that I have made on the whole travel. 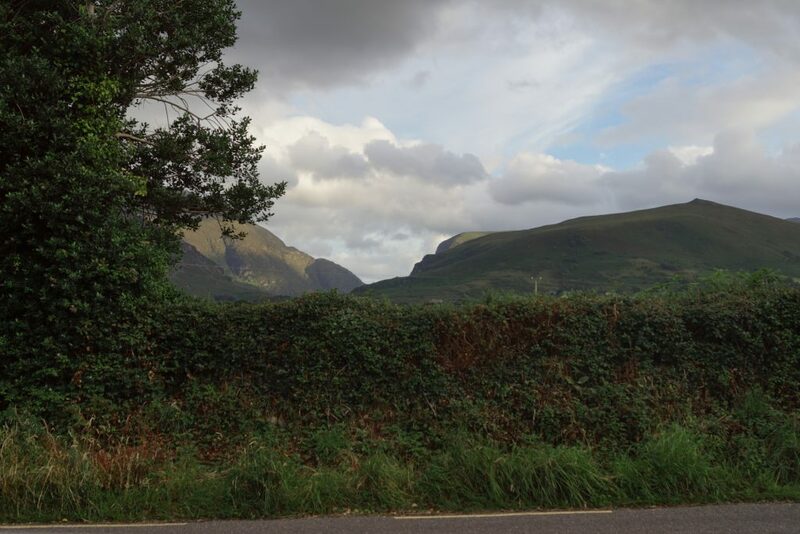 No photoshop, no filters, just plain directly from my camera… This must have been somewhere around the corner from Molls Gap, you can spot the Gap of Dunloe in the center of the picture, this time from the other side than I saw it on that morning.